The 2007 Chevy Avalanche is the next generation of the industry’s most flexible utility vehicle. It combines the passenger-comfort attributes of an SUV with the cargo capability of a truck. It is based on GM’s new, full-size SUV platform, which features more power with segment-leading fuel economy and flex-fuel capability; a sharper, more precise driving feel; increased interior refinement; and improved quietness. 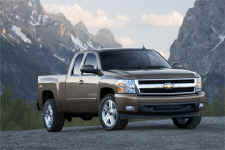 New for 2007, Colorado offers larger, more powerful inline four- and five-cylinder engines. Standard on all models except 4WD Crew Cabs is a 2.9L DOHC four-cylinder engine, rated at 185 horsepower and 190 lb.-ft. of torque* – increases of 10 horsepower and 5 lb.-ft. more than the previous four-cylinder. A new, 3.7L DOHC five-cylinder is standard on 4WD Crew Cabs and available on all other Colorado models; it is rated at 242 horsepower and 242 lb.-ft. of torque* – increases of 22 horsepower and 17 lb.-ft. over the previous five-cylinder. The 2007 Silverado lineup is built on an all-new platform that supports a smoother ride and responsive, confident handling while delivering segment-leading capability and power. A lineup of six powerful, Gen IV small-block V-8 engines complements the stronger chassis to deliver the light-duty segment’s highest-rated towing capacity (10,500 pounds), horsepower (367 hp) and fuel economy, with a maximum payload capacity of 2,160 pounds.